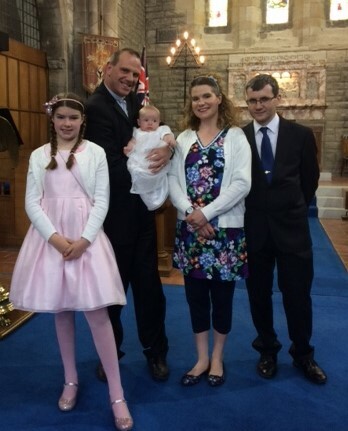 This happy picture shows the baptism of Artie Grahame Cunningham pictured with his parents Gordon and Gillian and big sister Katie with Rev. David Watson, our interim moderator during the vacancy, who officiated. Gillian has been actively involved with the 5th Saltcoats Girls’ Brigade for many years and Gordon is Captain of the 1st Saltcoats Boys Brigade. Both Companies are based in St Cuthbert’s Church. The Wednesday morning Exercise Class has lost their instructor so at the moment it continues as a Walking Group. The Girls’ Brigade Display on this coming Tuesday night sees Captain Lorna Hamilton retire. West Kilbride Parish church have organised a Ceilidh for our visitors from Malawi to experience Scottish music and dancing and the opportunity to socialise with members of our church and other churches in our Presbytery. The event will be in West Kilbride Village hall on Saturday 16th June starting at 7 pm. Tickets are £5.00 and can be requested from the church office, email office@westkilbrideparishchurch.org.uk or telephone 01294 829902 (answer phone out of hours). The hall only holds 120 people for a ceilidh and it is hoped that tickets will sell fast! Click below to select a magazine. The May edition of the Church magazine is now online. The April edition of the Church magazine is now online.